Grandchildren just left after their annual stay with me and Mrs TD, so there’s been little time to read or post. As I get my breath back, I thought I’d add just this little Aside note. I read somewhere that the ancient Romans used to employ the expression ‘drunk as a thrush’ [‘turdus’ in Latin], perhaps because they had seen these birds staggering around in vineyards after gorging on rotting, fermenting grapes. (Wasps, I believe, behave similarly with apples). 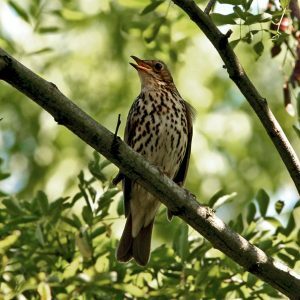 Some scholars think that it is < ex- (see ex- prefix) + turdus thrush (for the sense compare the French proverbial phrase soûl comme une grive , ‘drunk as a thrush’); some regard it as a contraction of *extorpidīre (Latin torpidus torpid adj. and n.) or of *exturbidīre (Latin turbidus turbid adj.). All these conjectures are open to grave objection. It’s thought in some quarters that when the Normans invaded England in 1066 they were referred to with this expression, which gave rise to the current sense, as defined in OED below. I could find no textual evidence to support this link, apart from a much later translation from the Latin verses, supposedly of Archbishop Thomas of York (d. 1100), in praise of William I, the Conqueror, which contains the line ‘he who the sturdy Normans ruled…’. It would seem by Tudor times to have become a collocation when referring to the Normans. Impetuously brave, fierce in combat. 1297 R. Gloucester’s Chron. (Rolls) 7936 Þe heyemen of engelond..mid gret ost wende uorþ & mid stourdi [v.r. stourde] mode. Recklessly violent, furious, ruthless, cruel. A brain-disease in sheep and cattle, which makes them run round and round; the turnsick. The Latin name of the Song Thrush, as in the picture above, derives from the Greek legend of Philomela, in which, according to Ovid’s version in Metamorphosis, she’s raped by Tereus, and escaped by turning into a nightingale. This was much translated and adapted by later English poets, alluded to by Eliot (‘so rudely forced’, she ‘filled all the desert with inviolable voice/And still she cried, and still the world pursued’), her plaintive song ‘”jug jug” to dirty ears’). As always his allusion indirectly echoes lines from previous works, from the Tudor poet Gascoigne through Coleridge, Keats and others. This entry was posted in Asides and tagged Norman Conquest, Ovid Metamorphosis, Philomel, sturdy, thrush, TS Eliot by Simon Lavery. Bookmark the permalink. Now, where does the expression “Dutch courage” come from? I’ll have to investigate this, one of these days. Hi Emma. Interesting question about ‘dutch courage’. I just looked online; most agree it was either used by British soldiers observing the way their Dutch opponents in the Thirty Years War (1618-48, largely between the Netherlands and Sweden, but involving most of the other main European powers, including France!) fortified themselves with genever or gin immediately before going into battle. The rival theory is that the English military developed the habit of drinking strong spirits not just gin, to calm and fortify themselves before fighting; the meaning later extended to suggest taking on drink to prepare oneself for any major challenge. The social importance of gin in English society from the 18C onwards is well known, from the pictures of Hogarth of the gin dens of the urban poor, to the expression ‘mother’s ruin’ – among other things. There’s always something interesting on your blog! Wow, thanks, Liz. I just post what has taken my fancy lately. Kind of you to say, though.